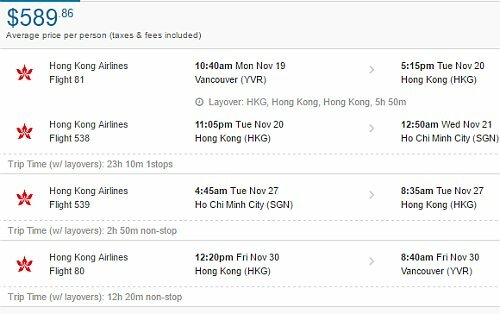 Hong Kong Airlines has dropped the price of some of their September, October, and November 2018 flights from Vancouver to Ho Chi Minh City (Saigon), Vietnam down to $485 CAD roundtrip including taxes. The flights have 1 stop each way, in Hong Kong, for 3-6 hours. You can also turn these into a 2-in-1 trip and visit both Vietnam *and* Hong Kong for $589 CAD roundtrip. The leg from Vancouver to Ho Chi Minh City, Vietnam has 1 stop. And then the other 2 legs are non-stop. Sep 10 to Sep 17 to Sep 20 -- new! Sep 17 to Sep 23 to Sep 26 -- new! Oct 1 to Oct 7 to Oct 10 -- new! Oct 1 to Oct 12 to Oct 15 -- new! Oct 10 to Oct 16 to Oct 19 -- new! Oct 19 to Oct 27 to Oct 30 -- new! Nov 5 to Nov 16 to Nov 19 -- new! Nov 12 to Nov 23 to Nov 26 -- new! Nov 19 to Nov 27 to Nov 30 -- new! Nov 19 to Nov 30 to Dec 3 -- new! Nov 26 to Dec 2 to Dec 5 -- new! TIP: To find more flights for this price, try using start and end dates from the list of the regular roundtrip flights at the top of this blog post. Try starting with Wednesday to Wednesday dates in February 2019. NOTE: Once your Flighthub search completes, click on 'Flexible Dates' to see more dates that are available for $580 roundtrip. 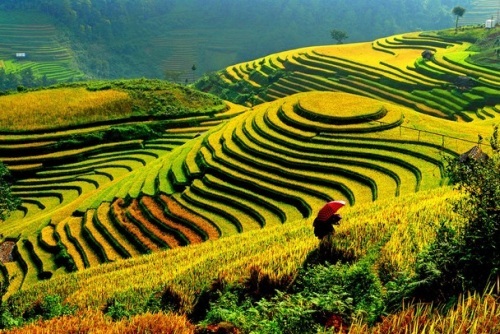 Update 4/20 - More flights from Vancouver to Vietnam for $551 to $577 roundtrip are now available, including new dates in September, October, November, February and March. 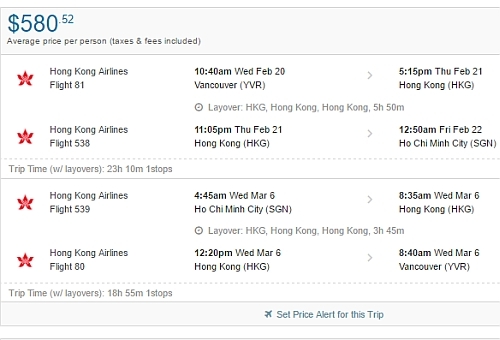 vancouver, yvr, flight deals, asia, southeast asia, ho chi minh city, sgn, vietnam, saigon and hong kong airlines. 2 Responses to "Vancouver to Ho Chi Minh City, Vietnam - $485 CAD roundtrip including taxes (add Hong Kong for $104)"
No problem Ray, have a great time!